Technique of the Week: Tossing | We Like to Cook! 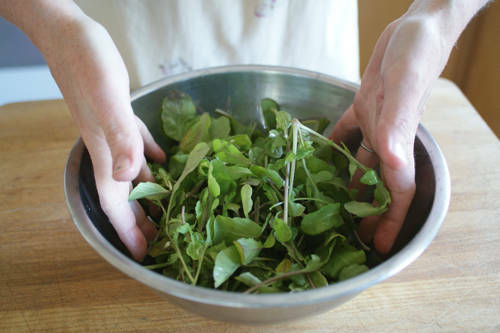 To mix the ingredients of a recipe, such as salads or pasta, by using a light lifting and fluffing gesture. The food is gently turned over and mixed together enabling sauces and food items to be seasoned with the flavors of each item without breaking them apart. Tossing can also refer to the technique of pan tossing in which the ingredients of a sauté pan are quickly mixed in a very efficient action without the use of utensils. This basic culinary technique involves using your wrist to flick ingredients into the air and change the placement of them within a pan. This method is used to combine, coat and distribute ingredients, such as vegetables, spices and sauce. Tossing ensures that the contents of the pan cook evenly and do not stick to the bottom. Tossing saves time and reduces clean-up by eliminating the need for cooking utensils. To achieve a good toss, grip the handle of the pan and shake the ingredients back and forth to prevent sticking. Holding the handle of the pan, lift the pan about 3 inches above the flame. Tilt the pan slightly toward you and flick your wrist in an upward motion while pulling your arm backward to toss the ingredients to the opposite side of the pan. This gently propels the ingredients into the air and back into the pan. The ingredients in the pan should be tossed every 2 to 3 minutes to provide even cooking of the dish. Editor's Note: Tossing has several other meanings with regard to consumption, predominantly as it relates to refreshing adult beverages. It can also refer to the inevitable bodily reaction when too many adult beverages have been "tossed" back.